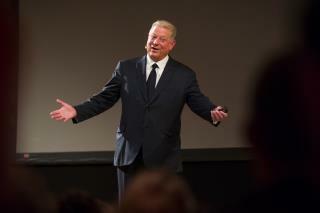 (Newser) – Al Gore has an issue with the Trump administration's timing. In a statement released Friday, he swung at the White House for releasing a major government report on climate change when it did. "Unbelievably deadly and tragic wildfires rage in the west, hurricanes batter our coasts—and the Trump administration chooses the Friday after Thanksgiving to try and bury this critical US assessment of the climate crisis," Gore wrote. "The President may try to hide the truth, but his own scientists and experts have made it as stark and clear as possible. The rest of us are listening to the scientists—and to Mother Nature." (Read his statement in full here.) He wasn't alone in his criticism. The AP quotes study co-author Andrew Light of the World Resources Institute as calling the timing "a transparent attempt by the Trump Administration to bury this report and continue the campaign of not only denying but suppressing the best of climate science." Most of us caught the report. We know that pollution is killing the earth. We are powerless to force out "politicians" to do anything about it. Prevention has always been the hardest thing to sell. Especially when greed rules.